I am addicted to Project Gutenberg. I check their latest titles section every day to see if I can add anything interesting to the various lists that I have every intention of reading Someday. But every so often I see something that demands attention NOW. 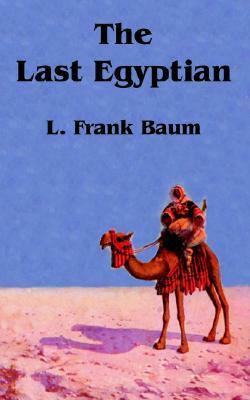 The Last Egyptian was added to Gutenberg on July 1. I saw it, made a note, and promised myself to dive in as soon as I could. I read my share of Oz books years ago, but I never knew Baum wrote such a book as this one. According to Wiki he published it anonymously in 1908. I went back to look closer at the cover illustration at PG and sure enough, there is no author's name on either the cover or the first pages. Also per wiki, Baum eventually acknowledged his authorship and made a movie of the book through the film company he had formed in 1914.So what happens in this 'romance of the Nile'? Nearly everything! You want a secret tomb? It's here! Treasure beyond belief? Got it! An old woman plotting her entire life to get revenge on the man who 'done her wrong'? She's here! A loving grandson willing to do anything to avenge Family Honor? He's here too! Bandits? Check. A beautiful woman in danger? Check again. True love? Triple check!!! Oh, and don't forget that mummy's curse! Never ever forget that!It was all very entertaining, even while being a bit predictable. I think it would make a pretty cool movie, but if it was filmed today the racial attitudes would have to be cleaned up. That attitude was not overwhelming, but it did lurk throughout, and a certain word was used twice in anger by the main target of the revenge plot. Not acceptable now and never should have been in the first place. I read the digital version of the first edition from Google Books. This is by far the best adult fiction I have read from Baum. A tale of betrayal and revenge reaching across three generations and set in the Nile valley. While outdated, the story line was quick moving and relatively captivating. L. Frank Baum - also wrote under the name Edith Van Dyne, Floyd AkersLyman Frank Baum was an American author, actor, and independent filmmaker best known as the creator, along with illustrator W. W. Denslow, of one of the most popular books in American children's literature, The Wonderful Wizard of Oz, better known today as simply The Wizard of Oz. He wrote thirteen sequels, nine other fantasy novels, and a plethora of other works (55 novels in total, 82 short stories, over 200 poems, an unknown number of scripts, and many miscellaneous writings), and made numerous attempts to bring his works to the stage and screen.